It's my turn for a tutorial on Gingersnaps this week, and the theme is 'Paint'. 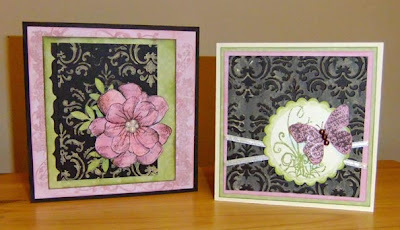 If you want to find out how I made the backgrounds on these two cards hop on over to Gingersnaps blog for my full step-by-step tutorial. I hope it is useful. These are just beautiful! I'm off to read how you've done them! Great tutorial, Katy! I just love those cards! Your tutorial was great and the cards are just beautiful!